How to Understand Yourself & Others in a Busy Work Place & Stay Frisky and Fabulous! This program will blend information regarding personality styles, managing stress, and keeping a fluid spirit through self-care strategies. First we look at work behavioral styles, how your style (and those around you) changes when there is office stress due to busy workloads, lots of customers and demands, “the need to get it right” and working in close proximity to one another! Learn humor skills to help keep a sense of perspective, to learn to “access the absurdity in times of adversity”. You’ll also learn and how to respond to others in a way that will decrease the tension and increase the trust between you and them. Donna Strickland, RN, MS, CS, and CSP is dedicated to improving the performance and health of both individuals and organizations. She is known for her work in Team and Leadership Development, Wellness and Resiliency and Organizational Change. Donna captivates audiences with her vigor, outrageous humor, and unforgettable honesty. Her energetic presence immediately involves people and has them instantly engaged in her depth-retrieving, bounce-back shock absorbers for dealing with life on life’s terms. She is known for her flair for drama and unique insight into human behavior. She works primarily with Fortune 100 companies and healthcare. Donna is actively involved in the Leadership Alchemy Program at NASA; she coaches disruptive executives, and works with organizations that are undergoing deep cultural change. Her clients also include the American Hospital Association, Hewlett-Packard, AT&T, The Mayo Clinic and hundreds of others. 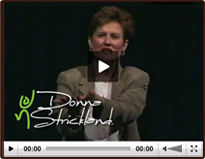 This entry was posted by Donna Strickland in Free Resources, Leadership and Team Development. Bookmark the permalink. Follow comments with the RSS feed for this post. Post a comment or leave a trackback.